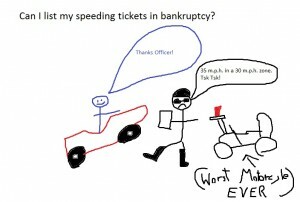 Can I list my speeding tickets in bankruptcy? But in a chapter 7, they will survive the bankruptcy. In a chapter 13, you can discharge them (wipe them out). This means that after a chapter 7 bankruptcy, you will still owe those speeding tickets. On the other hand, a chapter 13 will allow you to discharge those speeding tickets if you complete your court-confirmed plan. In other words, those speeding tickets that can survive a chapter 7 will not survive your chapter 13. This entry was posted in Utah Bankruptcy on May 27, 2015 by robertspaynelaw. I sold my car to my parents years ago, but they never registered it with the DMV. 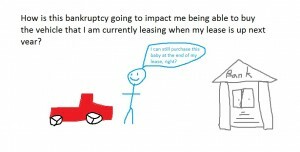 What happens in bankruptcy? It’s still your car. If you didn’t exempt it (protect it with your one bankruptcy car exemption), then the bankruptcy trustee will take it and sell it. I had a client recently who had a fairly boring, simple chapter 7. Months went by, and the trustee didn’t close out the case. Out of the blue, the trustee noticed up a 2004 exam (deposition). We went to the deposition, and the trustee asked my client why she was hiding a car in a storage unit. She told the trustee that it was her mother’s car that she had sold to her mom years ago. Mom couldn’t drive, so she was storing the car for her mother. We even offered to show the trustee a bill of sale that Mom signed years ago. Unfortunately, Mom never went to DMV and actually registered the car in her name. Even worse, she never had the title transferred to her name. This means that when the bk trustee ran a vehicle title search, it showed the car as still titled in my client’s name. The trustee would not accept the old title/bill of sale dated years ago. The bk trustee has dealt with too many dishonest debtors who would back date a bill of sale, and she wouldn’t give us the benefit of the doubt. We were given the choice of losing the vehicle to an auction or purchasing its value back from the trustee. This entry was posted in Utah Bankruptcy on May 22, 2015 by robertspaynelaw. 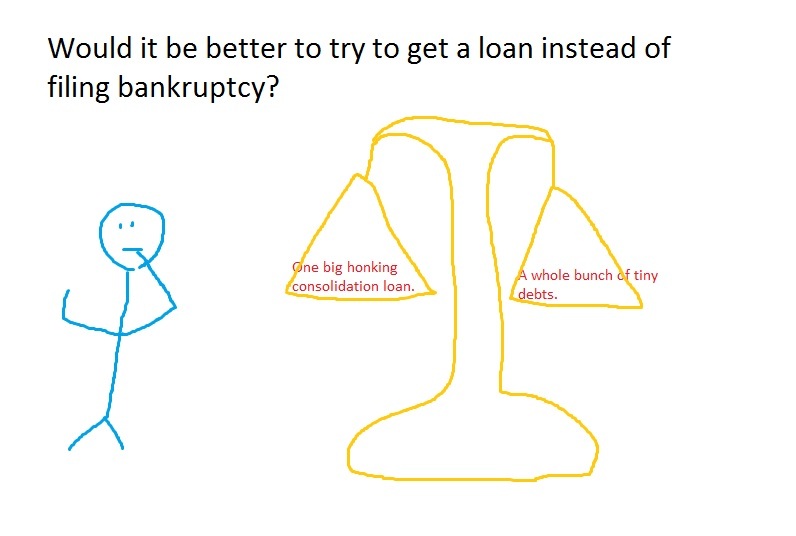 Would it be better to try to get a loan instead of filing bankruptcy? I had a potential client email me this question last week, and it’s complicated. If you have the credit, income, and assets to get some kind of consolidation loan instead of filing bankruptcy, then it’s going to be much, much better for your credit. You won’t have the black mark of bankruptcy on your credit. Your multiple creditors will all be content as you begin repaying your one big creditor. 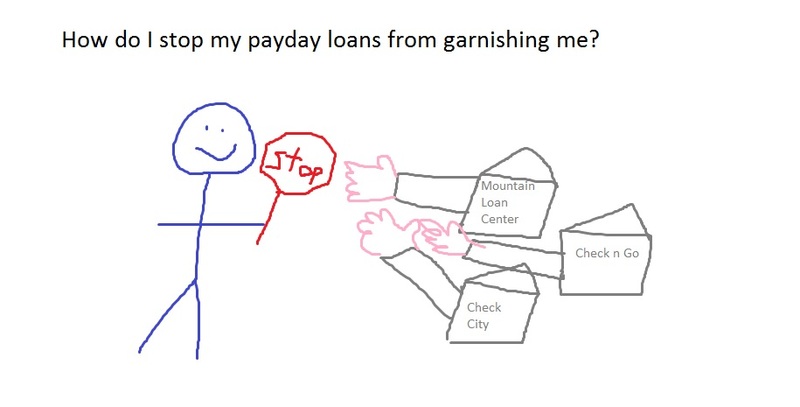 To be honest, I don’t know how many of my potential clients go this route and take out a consolidation loan that works. I don’t know because they never need to call me. However, I have many clients who have attempted to take out a consolidation loan and were denied. I have some who took out a consolidation loan and then couldn’t make the payments. These are the stories I hear about. In my experience, even if you can take out a consolidation loan, bankruptcy may be a better option to get your family back to zero instead of taking on a huge new debt. 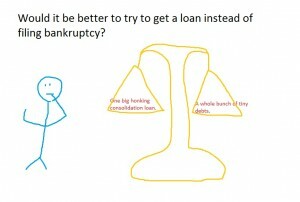 At a minimum, it would be a good idea to at least talk to a bankruptcy attorney and see what kind of options you have. This entry was posted in Utah Bankruptcy on May 21, 2015 by robertspaynelaw. How to I send documents to my bankruptcy trustee? If you are represented by counsel, let him take care of it. Normally, the trustee will use a service called doclink. Some trustees use another system called Epiq. 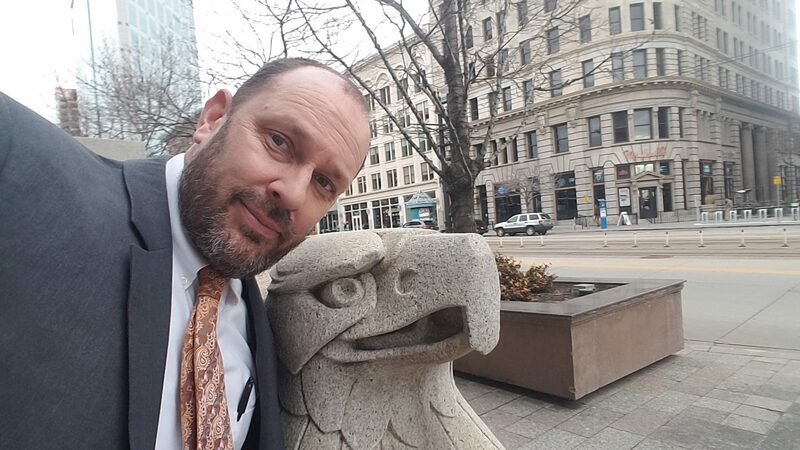 Our local chapter 13 trustee has created his own upload website. In the old days (less than 4 years ago), we would fax or even mail hard copies of the taxes, paystubs, or any other documents, directly to the bk trustees. Now, we simply upload scanned documents. If you are not represented by counsel, you still need to provide various documents to your bankruptcy trustee. Mailing a hard copy is safest, but if you call your trustee, he may allow you to email or fax those documents. This entry was posted in Utah Bankruptcy on May 19, 2015 by robertspaynelaw. How is this bankruptcy going to impact me being able to buy the vehicle that I am currently leasing when my lease is up next year? It’s going to make it really, really hard. When you file bankruptcy, your credit takes a hit (or goes up if it was already bad enough). The bankruptcy public record stays on your credit for 10 years. It takes about 2 years for your credit to improve enough to get good car loan interest rates again. That being said, the bankruptcy is going to hurt your credit at first and make it hard to finance that vehicle at the end of your lease. Yes, you can keep your lease out of the bankruptcy if you want and keep making lease payments until the lease officially ends. However, this does not guarantee that they will finance your purchase at the end of your lease. Personally, I don’t like financing cars. I have a horde of children, 4 teenager drivers, and five older cars all owned free and clear. I don’t have a car payment, which means that I don’t have to carry as expensive an insurance policy as a lender would require. I believe in buying “beaters” (cheap cars that you can drive into the dust) so that I can use the money for other things. I did a little research online and found three articles that disagree with me, saying that it may be a good idea to finance/purchase your leased car when the lease ends. I disagree, but that doesn’t mean that I’m right. 1. Save money on leasing a car, then buying it? 3. Should You Buy Your Leased Car? This entry was posted in Utah Bankruptcy on May 18, 2015 by robertspaynelaw. 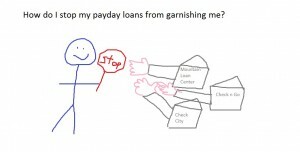 How do I stop my payday loans from garnishing me? Long Answer: When my clients ask me this, they already know that bankruptcy still stop garnishment, but it’s more complicated than that. To “garnish” you, they need to have a judgment against you, which means that they already filed a lawsuit, a constable served you, they got a judgment, and they’ve contacted your employer to garnish your paychecks. To take money out of your bank account, they don’t need any of this. All they need is a post-dated check or a signed ACH (electronic withdrawal authorization form) from you. They can hit your bank account over and over if you default on your payment plan with them. Bankruptcy does stop this, but if you cannot file bankruptcy yet, then you may want to contact your bank and tell them that you do NOT authorize any more electronic withdrawals from this creditor. This should keep them at bay until they do file a lawsuit. And yes, even if they sue you and have a judgment, filing bankruptcy will stop the eventual wage garnishment and/or bank levy. This entry was posted in Utah Bankruptcy on May 13, 2015 by robertspaynelaw. 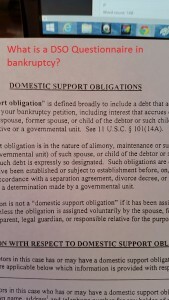 What is a DSO Questionnaire in bankruptcy? It is a form you have to fill out after you file bankruptcy but before you meet with the bk trustee at the 341 Meeting of Creditors. 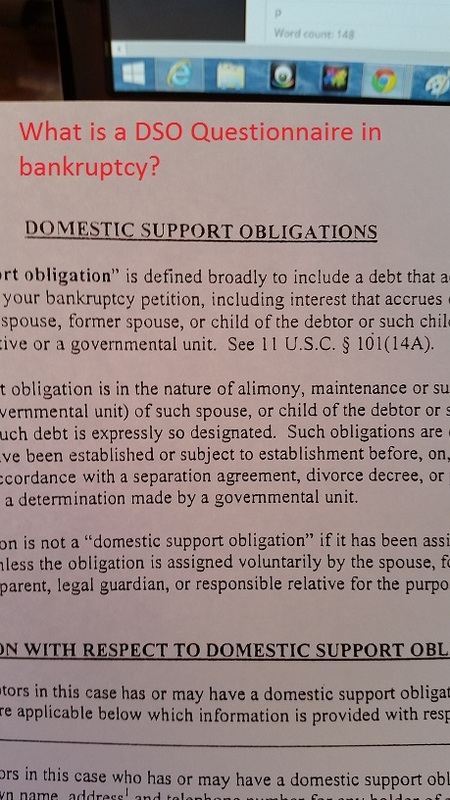 Even though bankruptcy does NOT discharge your child support or alimony obligations (Domestic Support Obligations or DSO), you are still required to list your DSO in your bankruptcy petition and give contact information for the person/entity who receives your DSO payments. This is not an obscure rule to make sure that your ex knows your business. It is designed so that if the trustee discovers that you have hidden assets, or if you have back child support due and owing, he can use any discovered assets to pay your oustanding obligations. Unfortunately, it does tell your ex that you’ve filed bankruptcy. They will receive notice of the bk. This entry was posted in Utah Bankruptcy on May 8, 2015 by robertspaynelaw. How long will it take for my bankruptcy to be discharged? It depends on whether you file a chapter 7 or a chapter 13. In a chapter 7, about 3 months. In a chapter 13, anywhere from 3 years to 5 years after you file. Day 1… file the case and get a case number. Day 30 -40… 341 Meeting of Creditors. Day 91… Discharge (so long as you’ve taken the second bk class). Same timing, except that you will not receive your discharge until the end of you plan. Your chapter 13 plan can be anywhere form 36 -60 months. Even after it is completed, you will need to file a Request and Verification for Discharge before you receive your discharge. This entry was posted in Utah Bankruptcy on May 5, 2015 by robertspaynelaw.